From various photos of lighthouse fog horns one may notice some are relatively small while others are very large. This gives the impression that the large horn must be extremely loud compared to the smaller horns. I recently saw a photo on a web site, a very large horn with the caption "How would you like to live near this?" However, things are not always as they may appear. The larger horns are not for producing louder sounds. The largest horns are designed to accommodate a lower tone, lower frequency sound whereas the smaller horns are for higher frequency sounds. The optimum size of the horn is determined by the wave length of the desired sound to be produced. Low frequency sounds have a very long comparative wave length. The closer the horns match the wave length the clearer the tone produced. If missmatched the sound is more like noise than a clear tone or clear note. A clear note is much more easily identified at a distance from a ship where there may exist noise from wind, engines and other local sources. Analogous to this are brass musical instruments. The sound of a small cornet compared to a larger trumpet and to that of a trombone or bass horn. The sound intensity may be the same but the sound lower notes The same relationship for wind instruments, string instruments and for percussion instruments. The electric sound signals currently in use are designed to produce a single note clear tone. Because the sound energy is concentrated at a single frequency over exposure to the sound may result in damage at that frequency in a person's hearing range. Test of various fog horns revealed that the higher pitch sound is more readily heard upwind while the lower pitch more easily heard when downwind or cross wind. Thus the horns of different size in the image below with the smaller aligned in the direction of the most often occurring winds. The tones of the two horns are matched but the smaller horn produces sound one octave higher than that of the larger horn. Wysocki? 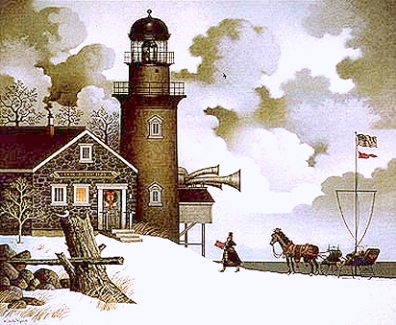 Perhaps fog horns but I know of only one of his several artistic lighthouse renderings that was not a lighthouse with only a bell. And for this one the horns are not shown.